The Hermitage is famously home to an army of cats who have guarded its treasures against rodents since 1745. 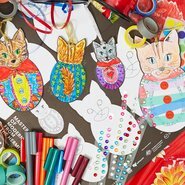 Celebrate a European Christmas at the Gallery with festive artmaking for the whole family by designing and decorating your own family of cats on outlines of Russian nesting dolls, a popular painted toy known as matryoshka or babushka dolls. For children with their parents or carers. All materials and instructions provided.